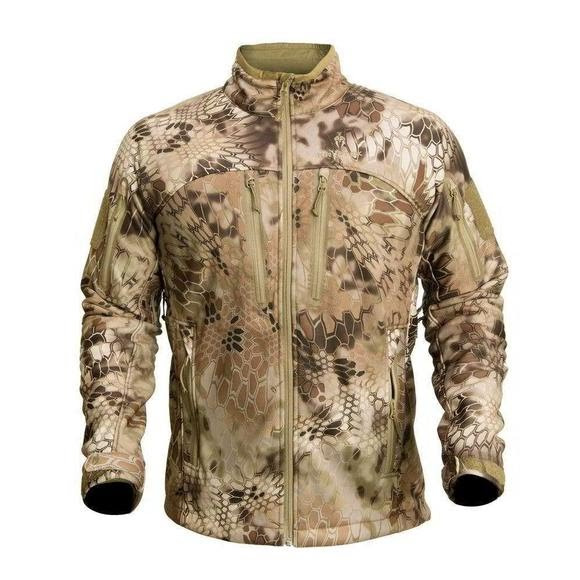 The Kryptek Apparel Cadog Jacket is part of their softshell system. In the past, Spartan warriors used the shield to fend off incoming arrows, swords and debris. Today's contender uses a softshell to fend off climate variables like wind, moisture and cool temperatures. This durable fabric adds warmth while allowing adequate ventilation and maintaining a low-profile fit for utility and comfort. The Kryptek Apparel Cadog Jacket is part of their softshell system. In the past, Spartan warriors used the shield to fend off incoming arrows, swords and debris. Today&apos;s contender uses a softshell to fend off climate variables like wind, moisture and cool temperatures. This durable fabric adds warmth while allowing adequate ventilation and maintaining a low-profile fit for utility and comfort. Numerous pockets and arm-pit zippers. Kryptek&apos;s objective is to provide combat proven features and designs in ultra high-performance technical and tactical outdoor adventure apparel. Darkness is the ally of the predator that prowls at night. Kryptek Typhon™ serves this who operate when and where others will not venture. I had one of these jackets when I was, well thinner. Gave it to my Grand daughter...she loves it. Love this jacket for hunting mid season here I PA...Happy to have a larger size from Bob Wards on my shoulders...I will stay warm and very comfortable in the tree stand for seasons to come. I will recommend this type of jacket and clothing to all who will listen.